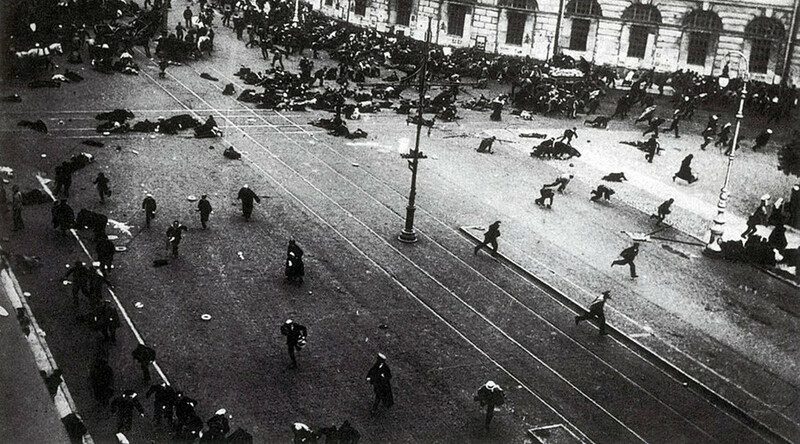 Weary of war and political crises, half a million soldiers and workers, led by the Bolsheviks, took to the streets of the Russian capital on July 17, 1917 to rise against the Provisional Government. #1917LIVE is RT’s project resurrecting the events and protagonists of the Russian Revolution. Readers can join the reenactment on Twitter and adopt the character of their favorite historical figure, using the #1917CROWD hashtag. Help us bring to life the histories that culminated in the explosive October Revolution. The demonstrations started earlier on July 16,1917, when soldiers of the 1st Machine-gun Regiment, influenced by the anarchists, engaged in spontaneous armed protests. The unrest soon swept Petrograd (now Saint-Petersburg) with industrial workers joining in. The July protests posed the biggest challenge so far for the liberal Provisional Government, which had been ruling Russia in tandem with the Soviets (workers and soldiers councils) since the monarchy was toppled in March, 1917. The Bolshevik leadership, initially hesitant, eventually decided to lead the demonstration, insisting that it should be peaceful. Protesters, however, showed up armed. Bolshevik leader Vladimir Lenin, who was out of town, promptly returned to the capital. He addressed the crowds calling for restraint, reassuring that the rule of Soviets will prevail. The protest paralyzed the city. As the demonstrators were making their way to Taurida Palace, where the Provisional Government was seated, they came under machine gun fire. They responded by shooting in all directions. It was not clear who shot at them. Clashes between protesters and forces loyal to the government and right-wing groups were playing out across the city. Authorities sent troops against the insurgents. Bolsheviks’ fellow Socialists, the Mensheviks and Socialist Revolutionaries, who were represented in the Provisional Government, did not approve of the mutiny and supported the crackdown against the protesters. According to medical officials, 16 people were shot dead, 40 died in hospital of wounds, and some 650 were injured. There were also students among the protesters. The youth of the time were swept away by intoxicating new ideas espoused by emerging left-wing politicians. Students, having no interest in their studies, occupied the rooms of their universities to hold endless political meetings. The parties of the day quickly realized the potential force of the student movement – they were easily swayed, changed their opinions based on how good the present speaker spoke, were fearless and had no social liabilities – the perfect material for mass rallies. RT introduced one such student into its interactive #1917LIVE project. Meet Vladimir Khlebtsevitch, a math and physics student at the University of Petrograd. Like many of his peers, he was completely sucked into the revolutionary fervor sweeping through the capital of that era. Unfortunately, he fell victim of the revolution. Khlebtsevitch was fatally shot during the mass rally. Though the prototype of our Twitter character died a few months earlier during the February Revolution, he was a real student from the town of Syzran. His body was transported to his parents, where a massive funeral was held to honor the young man’s revolutionary path. One of Syzran’s streets now bears his name.